During my years of teaching as a certified Pilates instructor, I have seen a deluge of magazine articles written praising the benefits of Pilates. Each one had a different spin on the topic depending on the type of exercise the author was promoting. Gyms and fitness trainers generally like to use the word “core” to convert their knowledge of the system, but their message is vague at best and they merely skim the surface of Pilates’ real value. Rather, beginner clients should be taught traditionally and correctly from the very first lesson so that the muscles will learn what the mind expects of them. In the traditional form, each level of apparatus is learned, practiced and then honed to a finer skill until the muscles are able to readily accept a new pattern of control. The process is a painstakingly slow one and yet, the challenge is never boring or tedious. The accomplishment for a client to conquer a new task is always a delightful and rewarding feeling for me, as a teacher, to witness. A great plus is that the body can return more quickly into the “muscle memory” mode after certain life changing events such as childbirth, injury, surgery, or just the normal aging process. When there is a solid foundation of Pilates under one’s belt, so to speak, the muscles act younger and react with more spring in their coordination of movements. 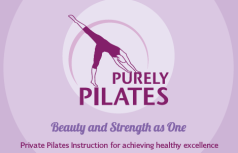 The most striking example I can recount is when I recently returned to the studio from which I was originally certified (now called True Pilates). I recognized a gentleman client from the days when I was an apprentice, still coming into the studio for his lessons. He was seated in the “Little Chair” doing the exercise “Boxing with Arm Springs”. I was taken aback at how similar in appearance he looked, although 10 years had passed, and how skilled his form and technique were. Surely, his age had to be close to 90 now, but nevertheless, he appeared agile and even more importantly, focused in body and mind. Truly, there is something to be said for the continuity built into each lesson plan and the harmony in which the mind and body interplay with that. Perhaps that is why so many dancers and professional show people gravitate to this art form. Originally only dancers and performers knew of this system, discovered its great appeal, and so it stayed quite elite and harbored from the general public. Now, Pilates is mainstream but the mission is, and should still be, to teach each client to the best of our ability, the way the system was meant to be taught. Just as the performers on stage need to be resilient and in peak shape to prevent a fall or injury, so does the average person who may one day prevent a debilitating slip on ice or rehabilitate a pulled muscle from overzealous golf or skiing activities. All reflexes are timed sequences between small movements of muscles, which are triggered millions of times a day. This reflexes become sharpened through Pilates. Ultimately, we would like our bodies to operate at their optimal levels, and what can aid us greatly in achieving that goal is Pilates. Get our FREE newsletter filled with news, specials and tips from Tracey.